If you have firm intentions to make a great career in the field of sport therapy, coaching, etc., getting a degree in Sports Science is what you need. When studying sports science, students will have an opportunity to gain such professions as health promotion specialist, sport administrator, event manager, etc. 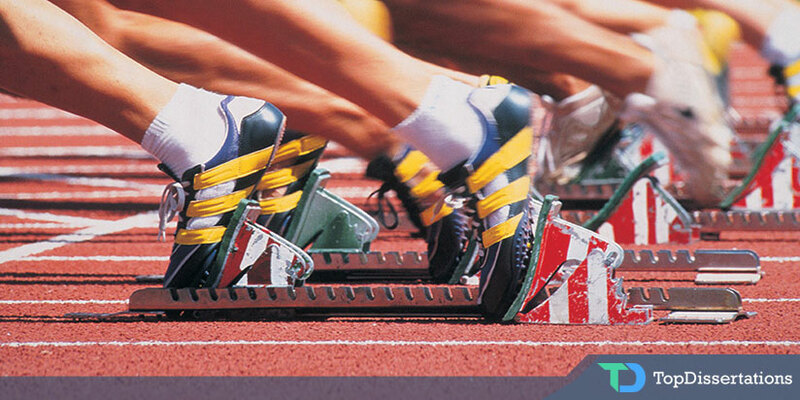 Before writing your dissertation, you should find an excellent topic related to sport. Thus, you will be able to enhance your career development. Browse the dissertation topics presented below and it will be easier for you to choose the one for your work. The role of a physiological basis in tennis. Detailed research on the muscle tissue as an essential prerequisite for achieving success in the area. Powerful muscles strong swimmers. Establishing the connection between the muscle tone and great results in swimming. Gymnastics exercises and neural processes. Discovering the issues arising on the gymnasts way to a good performance. Being a body builder: psychological and physiological qualities. Studying the interaction between the performance, physical exercises and nutrition among well-known body builders. Special physical exercises for strengthening skeletal muscles. Muscle strength as a decisive factor in athletic activity. Aging as a damaging effect on muscles. Examining muscle functions and metamorphosis among the women athletes during and after the period of menopause. Physical training: morphological and neurological peculiarities of bones and muscles. Nutrition as a source of strength. Exploring the up-to-date and old-fashioned ways of training. Investigating the methods of building up strength in retired basketball players. Dependence of the muscle strength upon gender. Studying physiological peculiarities of women and men athletes. Physical exercises suitable for elderly sportsmen. Examining the diseases the elderly gymnasts suffer from. Direct connection between sport and nutrition. Conducting thorough research on the balanced diet for sportsmen. Investigating the influence of food on the activity of football players. Athletic activity and nutrition. Analyzing different nutrition schemes for vegetarian sportsmen. Studying the effect of such schemes on athletes health. Strength sport: meeting protein specifications. Identifying the role of protein in bone development and muscle stretching. Connection between protein diet and effective training. Essential functions of vitamins. Examining vitamin supplements and their relation to impressive results in sport. Athletes suffering from a lack of vitamins. In-depth research on the effect of carbohydrate and protein supplements on the recovery of muscle glycogen after training. The amount of iron required for a good performance of athletes. Highlighting the difference between men and women. Supplements and sportsmens excellence. Exploring the use of bicarbonate, glutamine, and citrate supplements and their influence on athletes achievements. Caffeine and athletes accomplishments. Examining the intake of caffeine and its impact on athletes results in sport competitions. Valuable properties of vitamin D. What role does it play in athletes performance? Studying the effect of vitamin D on athletes health. Using the supplements prescribed by the doctor. Analyzing the position of international sports association on the use of supplements. Drug use and spectacular results in sport. Exploring the use of drug supplements by famous athletes. Examining the performance of the athletes using supplements and those who do not use any additives. Using the prescribed supplements and drugs in sport. Studying the most frequently used additives and drugs for respiratory cardiovascular diseases of athletes. Exercises suitable for sportsmen with hypertension. The opinion of the international sports association on the hypertension treatment given to athletes and physically active people. Pharmacology and ergogenic help in sport. Examining the diuretics use in sport. Exploring the impact of physical exercises on drug treatment for cardiovascular and respiratory diseases among popular sportsmen. Sport-related measures for treating bronchial complications. Analyzing the cases when athletes have been treated for inhalation of beta2-agonist during the 2012 Olympics. Tri-athletes having asthma. Exploring the effect of medication, training and exercises on the health of asthmatic sportsmen. Legal use of additives and drugs in sport. Analyzing international laws on supplement and drug use in football. The effect of adrenaline rush. Examining the case of women over the age of 45 in the USA and UK. Chronic diseases and nutrition specifications. Studying the nutrition demands for athletes having chronic diseases. Sportsmen with cardiovascular medication. Investigating the cases of cardiovascular medication use by athletes during the 2012 Olympics. Difficulties of using the heart rate as a means of measuring the intensity of exercises. Therapy for stem cells. Exploring the peculiarities of stem cell therapy and measures for treating athletes for osteoarthritis and cartilage deficiencies. The cycle of satellite cells. The role of satellite stem cells in regulation, growth, and muscle regeneration during physical exercises. Controlling diseases. Toning muscles during exercises. Investigation of the effect of myonuclear domain on proliferation and differentiation of diseases, stem cell cycle and adaptation of a human organism. Satellite cells and testosterone. Analyzing the cellular and molecular mechanisms. Determining the connection between the peculiarities of testosterone and impressive achievements in sport. Sport training and satellite stem cells. Exploring the influence of hard training on the satellite stem cells contained in the skeletal muscles of sportsmen. Satellite cells, hyperplasia, and hypertrophy. Inspecting the heterogeneity of swimmers satellite cell muscles and cell division orientation. Satellite stem cells development. Exploring the characteristic features of the satellite stem cells, i.e. functions, proliferation, and origin. Adaptation of the satellite stem cells. Investigating the peculiarities of trapezius muscles during training or aerobics. Satellite cells and components relating to age. Examining the functions and heterogeneity of the satellite stem cells of an adult athlete. Exploring the connection between the development, fitness and strength of mitochondria of athletes with insulin sensitivity. Cell metabolism and the functions of mitochondria. Examining the role of mitochondrial overload and partial fatty acid oxidation. Analyzing their effect on the skeletal muscles increment in tough training. The effect of aging on metabolism. Studying the use of anti-aging drugs with the aim of avoiding syndromes relating to metabolism among elder sportsmen. Metabolic disorders. Controlling obesity and the level of insulin with the help of drugs and special exercises for skeletal muscles of sportsmen. Can the level of insulin caused by fat food be decreased by the growth of muscle mitochondrion mass? Examining the role of fat food and insulin resistance during the period of strength training. Is it possible to compromise both glucose tolerance and metabolic flexibility by deleting particular muscles of carnitine acetyltransferase after physical exercises? Studying muscle exercises and metabolic fitness in terms of power lifting trainings. Obesity and metabolic fitness. Analyzing cellular energy transductions and their impact on obesity of athletes. Deficiency of carnitine. Investigating the influence of aging and excessive nutrition on mitochondrial functions and metabolic control when doing physical exercises. Type 2 diabetes and metabolic fitness. Discovering the connection between the functions of mitochondrial oxidation and type 2 diabetes during physical exercises. Diseases and metabolic health. Research on the functions of lipid oxidation and mitochondrial uncoupling during mental conditioning and aerobic exercises. Strength training and intrinsic biomechanics. Applying pectoral bench recruitment techniques to bench pressing during weight lifting exercises. Extrinsic and intrinsic biomechanics. Exploring the newbie gain and the period of its duration. Analyzing the registration of gain levels among sportsmen and sportswomen. Weight exercises: nutrient supplementation and biomechanics. Studying various gain levels of people using additives and those who do not deal with any supplements when being on a diet for four months. Strength training. Using the bands when undergoing strength training with the aim of growing muscle gains and maximizing positive effect. Male and female athletes. Exploring the biomechanics and functions of coaching among top women athletes during intelligence exercises. Temperature and biomechanics. Analyzing the functioning of athletes muscles during isometric exercises according to the temperature change. Exploring the cases of European and African athletes. Puberty exercises and athletic kinds of sport. Examining the condition of women athletes before and after the puberty age and probable metabolic outcomes. Biomechanics processes. The significance of being aware of biomechanics basics before doing German volume exercises. Human movements and biomechanics. Making a detailed analysis of the peculiarities of cell biology biomechanics in terms of nutrition during the circuit exercises. Human physiology and biological measurement. Examining the basic aspects of human physiology, physiological parameters and homeostasis processes during body building exercises. Evaluating the functions and physical condition of people in football and aerobic training. Defining the role of structural and physical exercises in the physiological and psychological wellbeing and development of football players. The importance of nutrition and physical exercises for athletes. Discovering the correlation between the physical activity and healthy food consumption of top-rated athletes. Metabolic-related training and exercise development. Studying the concepts and theories relating to metabolism of nutrients in metabolic training. Wellbeing from the point of view of college football players. Exploring the cases of college footballers of England. Athletes welfare and achievements. The impact of mental welfare on physical activity among high-class athletes. Opinion on the notion of wellbeing among swimmers. Examining the way happiness and enjoyment is connected with the accomplishments of experienced swimmers. Cultural welfare in the football area. Analyzing the cases of European footballers from the point of view of their self-respect and satisfaction rate. Work and wellbeing from the athletes point of view. Analyzing personal qualities of professional athletes and their input. Welfare and marital status in football. Exploring the cases of single and married football players of England. The role of gender, age, and subjective welfare in football training. Analyzing the alterations in physical exercises in terms of age and cross-sectional gender during strengthening football exercises. Examining the difficulties the coaches encounter when dealing with performance and behavioral intervention issues. Scrutinizing the case of the coaching fraternity in the National team of England. Parenthood and training. The problems working parents having little children face and possible impact on their achievements. Coaching and homosexuality. Examining the cases of gay trainers in the National Collegiate Athletic Association. Cultural analysis and gender in training. Exploring cultural and gender inconsistencies in sport. Investigating the cases of Spanish football players. The role of gender in coaching. Analyzing the attitude of coaches to female and male athletes. Injuries in sport. Is it effective to use an implemented model of injuries to sustain psychological growth of hurt high school athletes? Is being fat embarrassed? Examining the nervous tension women gymnasts suffer from because of the created body image. Sport leaders. Examining the attitude of athletes to team coaches. Changing ones sport career. Analyzing the psychological impact of a career change due to injuries in the football clubs of the United Kingdom. Body image and food consumption. Examining the effect of food consumption by women athletes in England. Making an analysis of the positive effect of music on the intensity of physical exercises among athletes. Examining the performance of online and TV gymnasts. Exploring the negative influence of smoking on childrens organism. Do pulmonary abnormalities can be caused by children athletes addiction to smoking? Can the blood pressure be affected by PDE5 inhibitors? Examining the influence of applying PDE5 inhibitors by male football players. The use of different training techniques. Exploring the implementation of non-uniform training and its impact on athletes achievements in the competitions. The fundamental peculiarities of the training process among patients with heart diseases. Doing research on the discrepancies in rehabilitation rates among the athletes with heart diseases. Physical exercises and age. Identifying the gap in the knowledge of athletes of different age range. The non-impact exercises and the physiological and psychological influence they make on athletes. Examining female athletes who are over 45 years old. Training in the areas with high and low altitude. Which area helps athletes achieve better results? Analyzing the accomplishments and conditions of European athletes training in the high and low altitude areas. Metabolic disorders and physical exercises suitable for athletes with pulmonary and cardiac issues. Detailed examination of prescriptions, methods, training and special programs for athletes with chest and heart problems. Motivational aspects of physical training. Physiological and psychological peculiarities of youth athletes. Exploring their attitude to exercises. Illustrating the importance of doing physical exercises and examining the influence of oral contraceptives. Examining college female athletes in the UK within the period of 6 months. Athletes achievements and family ties. Doing detailed research on athletes family background and establishing a direct connection between the family and athletes success. Studying the aims pursued by prospective and professional athletes. Defining similar and distinctive features. Sport and autism. Carrying out an objective analysis of the achievements of children with spectrum autism and those without it in the middle school. Volatile kinds of sport and androgenic anabolic steroids. Examining the cases of the mentioned steroid use in boxing. The role of muscle strength in different kinds of sports and its functioning when being injured. Exploring the physical condition of male and female rugby players. Women in sport. The influence of sports on the position of women in the society and their body. The effect of school programs on students achievements in sport. Determining the educational establishments in England with the highest rate of success in sport. Sport and leisure activities. Analyzing the lifestyle of famous English football players and its impact on sport accomplishments. The attitude of hospital staff to sport as a way of spending their free time. Investigating the case of a particular hospital.